Most of Northern Europe’s towns have multiple level houses in their central or down town streets, Dieppe is no exception. If you look at the existing photographs from the Dieppe raid, as well as more recent ones, you can see that the town front along the Promenade is made up of a wide variety of different buildings. Instead of sticking rigidly to copying the Dieppe buildings I thought I would just stick to the general style. I also looked through other books, magazines and model catalogues until I found something I liked. For scale I decided to stay with 1/100, some people like to scale their buildings down so they are smaller than the scale of their miniatures, but since Flames of War is a 1 to 1 ratio game I’m going to stick to 1/100. 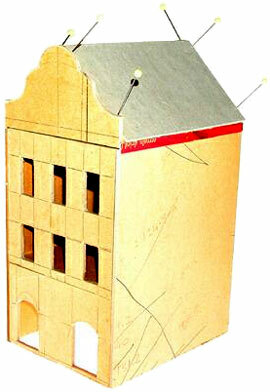 To get a good idea of size I used a 1/160 scale European building I had already and scaled the measurements up to 1/100. 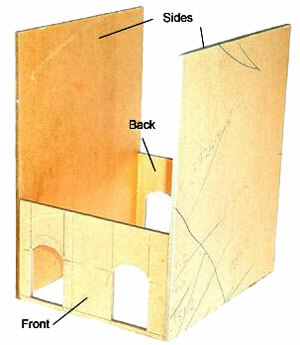 The basics you will need are a cutting mat or board, a craft knife, PVA glue, pins or thumbtacks, a steel rule. For the basic structure I used fairly thick art card (about 1.5-2mm) which is available from most stationary and art stores. I use this because it is cheap and I have lots of it. You may like to use foam card or plastic card instead. 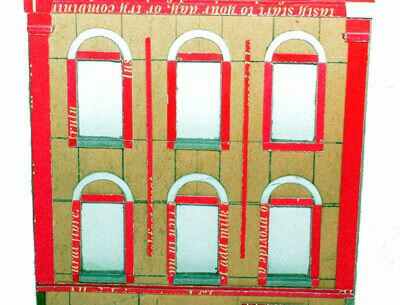 First I cut out the two sidewalls, unless you are making a corner building you don’t need to make windows in these. They measure 108mm x 131mm. Glued between these are the front and back walls of the ground floor. I’ve made this level separate so I can pull the building apart for gaming and put troops in the different levels. They measure 51mm by 82mm. The front has two large double doors. Always cut the doors and windows out before you glue the walls together. The back has one double door and a window. The doors at the back and front line up as if they form a passage or alleyway. Next I made the 1st/2nd floor section. 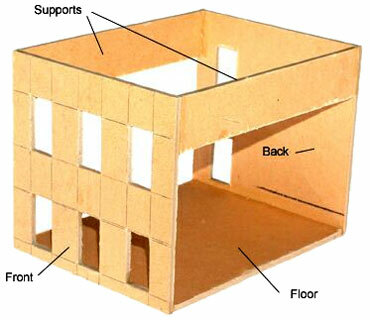 The front and back walls were made from the same strip of card as the ground floor to keep the 82mm width constant. Windows were then cut out. 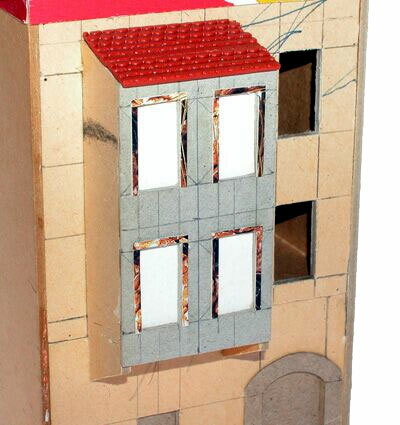 The card I’m using is 2mm thick, so I made a floor section for the 1st floor the same width as the front and back walls (82mm) and 104mm deep (108mm – 4mm for the thickness of the walls). This was glued to the bottom inside backs of the facing walls. Two strips of card were glued at the top for strength. Next I made three sections for the roof structure. 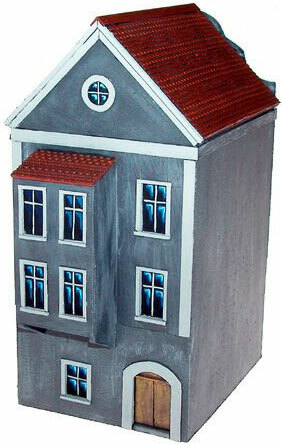 The first one was the false front of the front of the roof. This was made in an ornate shape to be further decorated later. 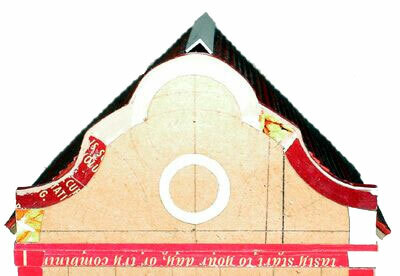 The next two are identical and conform to the shape of the roof, which it this case is a basic triangle. 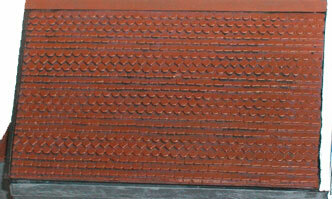 Both are triangles 82mm wide x 47mm high. One triangle had a 5mm high strip left on it to sit flush with the top of the 1st/2nd floor section. 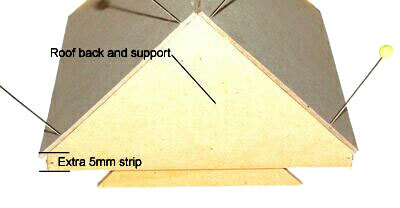 Two 5mm x 104mm strips were made and glued between the outer edges of the back wall triangle and the false front. 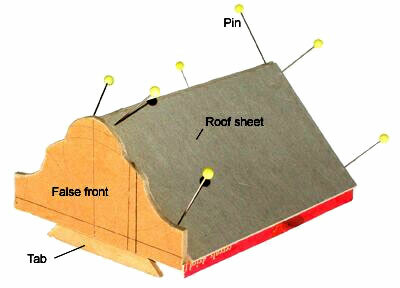 Glue some bits of scrap card to the inside of the roof front and back, with about 5mm sticking out the bottoms to act as tabs for fitting the roof. Then glue the remaining triangle (the one without the extra 5mm strip) butted against the front tab resting on the side strips. Further reinforcing can be added. I then cut out two roof base sheets the same size 106mm x 62mm. These are then glued to the roof structure. 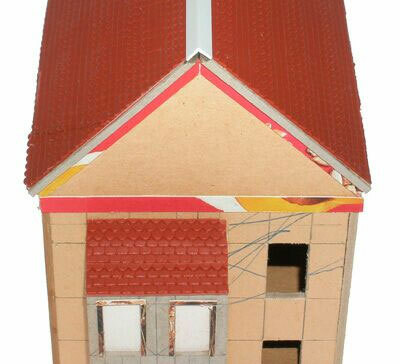 I then added thin card strips along the roof sides to align the roof when it is placed on top of the other two sections. These tabs over lap the bottom of the roof section by about 3mm. You could also use a peg and hole system for aligning the sections. 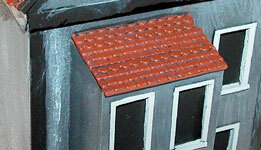 For the roof tiles I just used pre made tile sheets available from most hobby stores. I cut them to size then glued them to the roof base sheets. I decided to put an extra section on the back of the building. This was made out of the thick card and glued to the back of the middle section. I used tile off cuts from the roof for its roof. Detailing. For this I used thin card from an old cereal box. I framed the windows and doors. I also ran strips up the side of the 1st/2nd floor section to hide the join where it slides in. These bits were just glued to the 1st/2nd floor section to overlap the main sidewalls. Any gaps and joins can be filled in with a bit of modelling putty. Right: Here I built the doors and frames from card and scored some of the door parts with a sharp knife to give a wood panel effect. 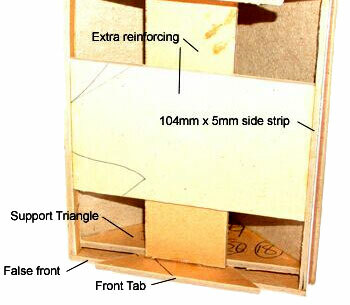 Above: I used thin strips of card to build up the frames and sills. Small gaps will be filled in latter with putty. I also ran ledges around the column tops. Below: I cut out some circles to match the shapes of the roof false front and trimed them to fit. 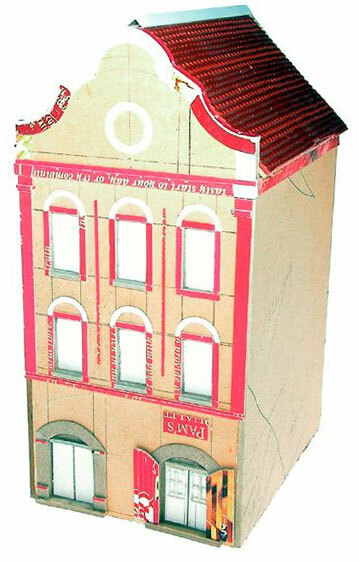 Left: The Finished building ready for painting. Now I’ve finished my building its time to give it a lick of paint. I’ve already worked out a colour scheme, so my next job is to undercoat it. For this I used matt black spray paint available from any hardware or paint store. Remember to always give the can a good shake before use and to spray in a well-ventilated area. Try not to breath in the paint particles in the air (a cheap paper mask can easily stop this), as it is not good for you. As this building is multi part and designed so you can place your troops inside it I will undercoat and paint it in parts, as painting it as a whole will fuse the parts together. 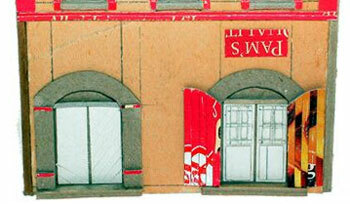 Once undercoated I put the building together to see if all the bits still fitted with a layer of paint on. I did but I had to do a little trimming where the middle section slides into the bottom section, I just removed some thick paint along the wall edges with sharp knife. Left: I have removed some of the build up of paint with a sharp knife. The front of the building is going to be blue with white details (windows, door frames etc) and the rest of the building will be grey, with lighter grey detail. 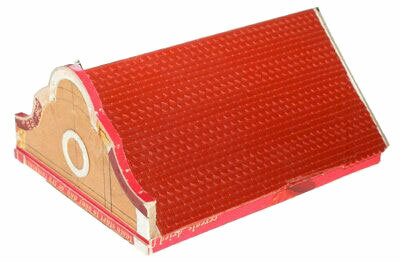 The roof will be red brown tiles. 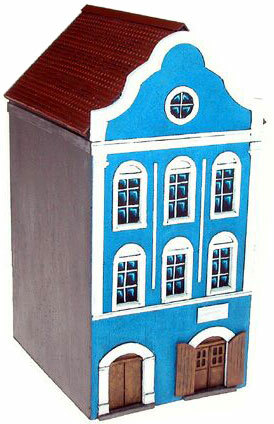 First I painted the Blue front of the building, with a medium blue. House paint test pots are great for this sort of thing (and for any terrain painting). For a small amount of money you get about 50ml of acrylic paint that will last you quite a while. It also means you are not wasting your good miniature paints on large areas. Once I have painted the base colours of blue and grey I then dry brushed a lighter shade of each colour over the base coats to give a weathered effect. Once the base coats were done I started on the detail, I choose white for the front and light grey for the back. With the white paint I’m using (some old Poly S I’ve had lying about for years) it is a bit thick and needs a touch of water to help it flow properly. I find that painting white over large areas is best done in parts, so I usually put a couple of coats on, waiting for the first coat to dry before applying the next. I then painted the roof, this was wet brushed (like dry brushing with more paint) rust brown, and once dry it was then dry brushed with an orange brown. Right: For the light grey it was a lot easier as most grey paints seem to have reasonably good coverage. Left: The white detail is complete ready for door, step and window painting. Next I painted the Doors. All three I painted as stained wood. First I painted them dark brown then highlighted them with an orange brown. The doorsteps were painted stone grey then dry brushed with a lighter shade. 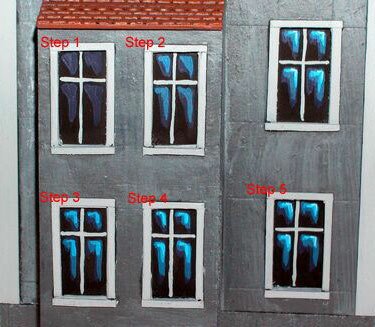 Then I painted the windows. During all the other painting I tried to leave the windows black. 1. I then painted the cross between the panes, white in this case to match the frames, light grey at the back. 2. Next I painted a very dark blue blob in the right top corner of each pane. 3. Then a smaller ¬ shaped blob of a lighter shade. 4. Followed by a lighter shade again. Finally any signs and advertising can be added. You may like to varnish your building, but I personally don’t bother as they are made of card and are more likely to dent rather than chip if roughly handled. I find it easier just to touch them up every now and again. I Hope you all have a go and have many happy hours of modeling.